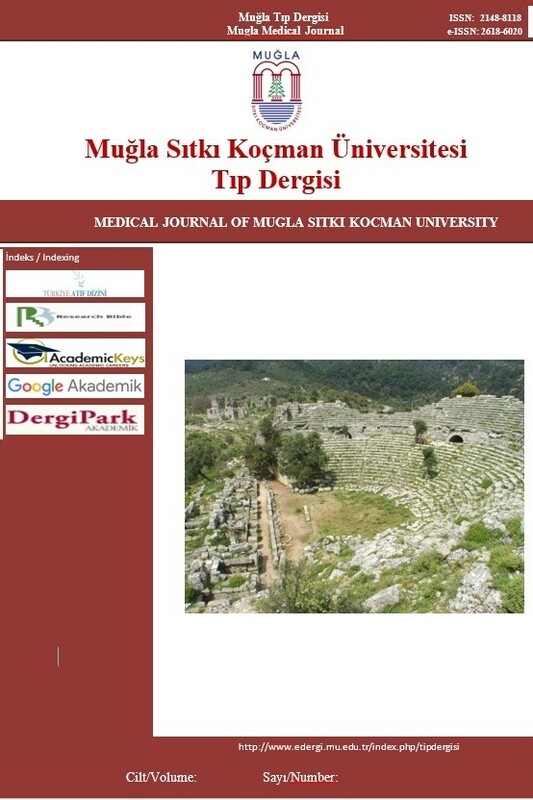 Medical Journal of Mugla Sitki Kocman University is a periodical of Medical School of Mugla Sitki Kocman University and is published three times per year; in April, August, and December. The Medical Journal of Mugla Sitki Kocman University’s publication languages are both Turkish and English. The articles which could be prospective or retrospective on investigational studies, case reports, letter to the editor and reviews of every aspect of medicine are published. The studies should have paramount ethical and scientific standards as well as no commercial concerns. Articles are accepted for publication on the condition that they are original, are not under consideration by another journal, or have not been previously published. The Medical Journal of Mugla Sitki Kocman University is indexed by Türkiye Atıf Dizini, Google Scholar, Academic Keys and Research Bib. All manuscripts must be submitted electronically on the Authors are responsible for all content of the manuscripts. Rights to the use and reproduction, including in the electronic media, of all communications, papers, photographs and illustrations appearing in this journal belong to the Turkish Journal of Physical medicine and Rehabilitation, Reproduction without prior written permission of part or all of and material is forbidden. All rights are reserved. Published content of the journal is in authors’ own responsibility. Mugla Sitki Kocman University School of Medicine, editors, employees and the publisher do not accept any financial, legal or any other liability for the published material.